I like my diet to be versatile. It’s the key component to a healthy, fun and sustainable diet. That’s why I aim to consume as often as I can out of the four nutritional kingdoms and combine different diets. This means that I eat in a way that I find the best benefit for my body. Many people, though, eat constantly the same 5 dishes. This is not only boring but unhealthy. Here’s a vegan and very easy way to change things up a little, with my one minute treat. My one minute treat consists mainly of two different ingredients. One of those ingredients is berries. I used blueberries, blackberries, raspberries and strawberries. They are full of micronutrients and relatively low in calories as they contain basically no fat nor protein and surprisingly little amounts of carbohydrates. 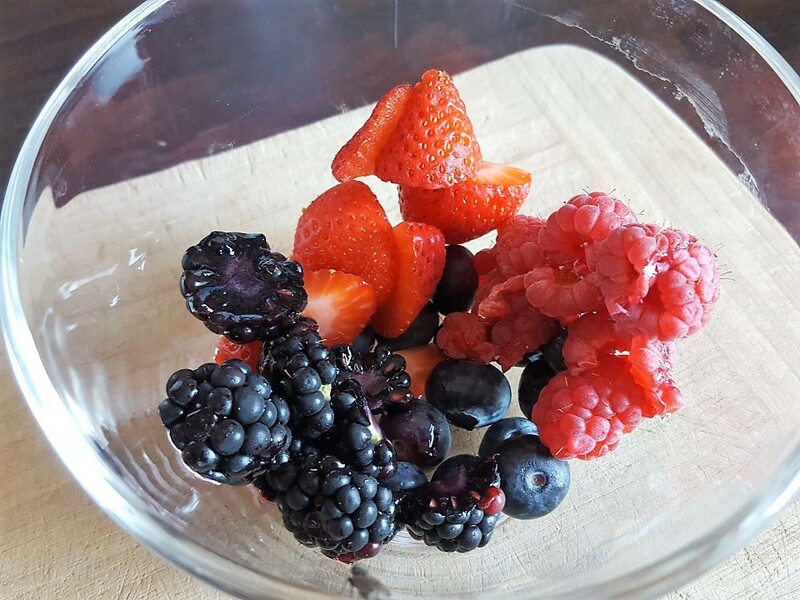 Berries have one key component in common, they contain polyphenols. They are the most common antioxidants in our diets and act as so called reducing agents. In their role as reducing agent, together with others such as vitamins C and E for instance, is to protect your body’s tissue against oxidative stress for once and issues related to this, such as inflammatory stress, heart disease and cancer ( – ). They may also help in the reduction of age related memory loss. As discussed in a previous article, bioavailability is an important factor for polyphenols in order to work properly. Luckily it seems that bioavailability of black and red berries is relatively good compared to other compounds, like curcumin for instance. In the past, I have been eating plenty of quark (low fat cottage cheese). I think I went a little overboard there and got a little sick and tired of it. Since then I’ve been eating more dairy yogurt and more and more vegan yogurt, soy-quark and milk. 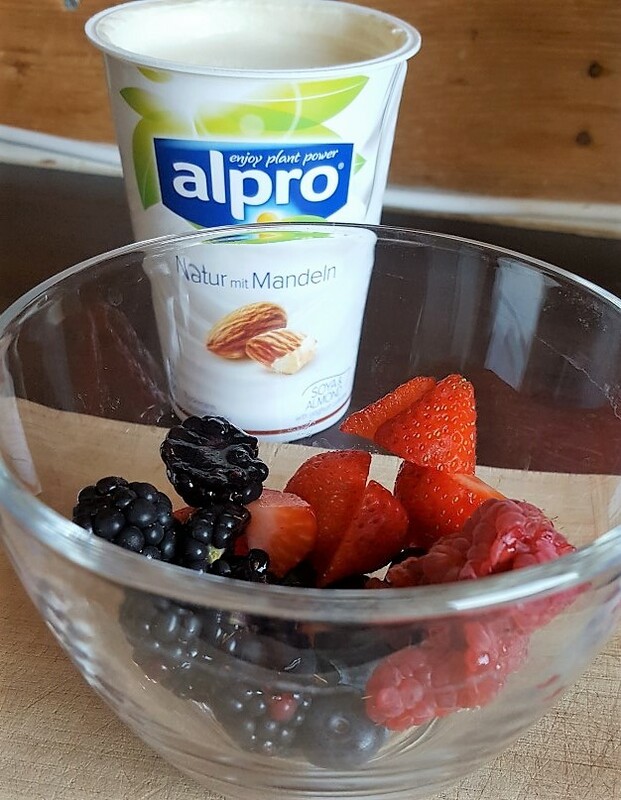 Vegan yogurt, in this case, a mixture of soy and almonds from Alpro, is the second ingredient for my one minute treat. I try to make my food vegan whenever I can and whenever it makes no difference. That’s a convenient way to implement a vegan lifestyle if you are interested in this. That’s it already. Just mix the ingredients together and enjoy. 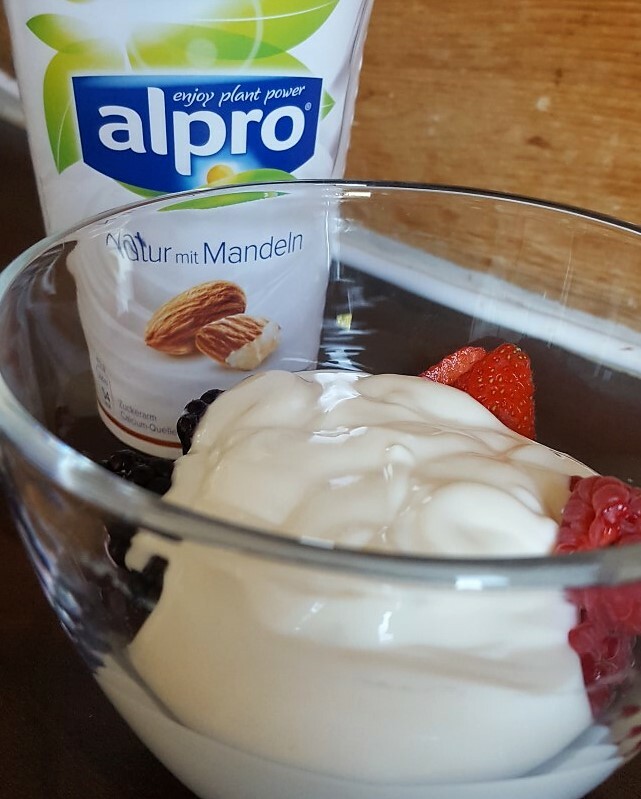 If you fancy a little more flavour or calories, add a few nuts and maple syrup to the mix – if you want to stay vegan. Or add some honey. You can also add cinnamon, chocolate nibs or better even cocoa nibs to your treat. I hope you enjoyed this recipe. It’s so easy and fast to prepare. It is nutrient rich and can be adjusted to what’s in season too. Go ahead and share this recipe with your friends or make it yourself. Let me know how it turned out. 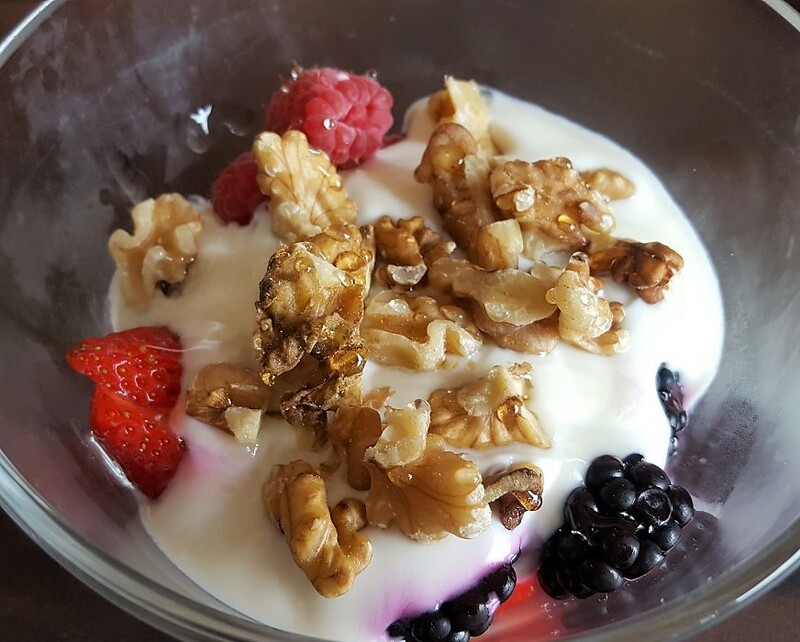 This entry was posted in Low Carb Diet, Recipe, Vegan Diet and tagged almond, Alpro, berries, blackberries, blueberries, dessert, jogurt, low carb, raspberries, snack, soya, strawberries, treat, vegan by Stefan. Bookmark the permalink.